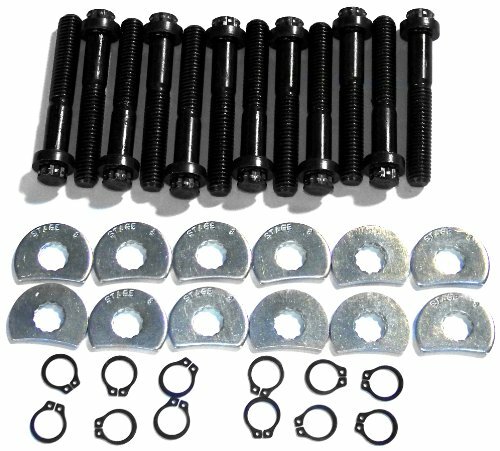 Stage 8 Locking CV Joint Kit features a locking header bolt kit with 1 inch bolts for Ford big blocks. It is 390 - 460 cu/inches including 351C and 351M. It also has GM Big Blocks 396 - 502 cu/inches. It includes (16 ea) 3/8-16 X 1 inch 6 point bolts with DHH (includes 3/16 inch recessed allen head) and matching locking hardware. CV JOINT 10MM Item Number: 8327 (12) 10mm-1.50X50mm 12PT Bolts. 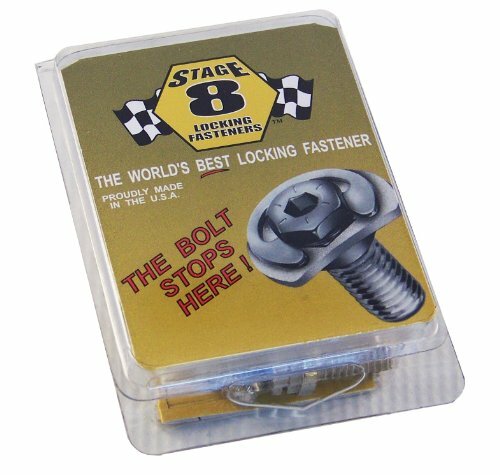 Stage 8 manufacturers the World's Best Active Mechanical Locking systems. Our locking fastener solutions are fail-safe when used and installed as directed. They are removable and reusable and can be visually inspected; if the locking retainer and clip are present then no fastener rotation has occured. Our locking systems are used on the Space Shuttle, Caterpiller Tractors, Ford Racing, Armored Combat Vehicles and many, many other applications. CV JOINT 10MM Item Number: 8335 (12) 10mm-1.50x55mm 12PT Bolts. Stage 8 manufacturers the World's Best Active Mechanical Locking systems. Our locking fastener solutions are fail-safe when used and installed as directed. They are removable and reusable and can be visually inspected; if the locking retainer and clip are present then no fastener rotation has occured. Our locking systems are used on the Space Shuttle, Caterpiller Tractors, Ford Racing, Armored Combat Vehicles and many, many other applications. CV JOINT 8MM-1.25 X 45MM (12 BOLTS) Item Number: 8320 (12) 8mm-1.25x45mm bolts 12pt. Stage 8 manufacturers the World's Best Active Mechanical Locking systems. Our locking fastener solutions are fail-safe when used and installed as directed. They are removable and reusable and can be visually inspected; if the locking retainer and clip are present then no fastener rotation has occured. Our locking systems are used on the Space Shuttle, Caterpiller Tractors, Ford Racing, Armored Combat Vehicles and many, many other applications. CV JOINT 10MM Item Number: 8331 (16) 10mm-1.50X55mm 12PT Bolts. Stage 8 manufacturers the World's Best Active Mechanical Locking systems. Our locking fastener solutions are fail-safe when used and installed as directed. They are removable and reusable and can be visually inspected; if the locking retainer and clip are present then no fastener rotation has occured. Our locking systems are used on the Space Shuttle, Caterpiller Tractors, Ford Racing, Armored Combat Vehicles and many, many other applications. CV JOINT 8MM Item Number: 8332 (12) 8mm-1.25x55mm bolts 12pt. Stage 8 manufacturers the World's Best Active Mechanical Locking systems. Our locking fastener solutions are fail-safe when used and installed as directed. They are removable and reusable and can be visually inspected; if the locking retainer and clip are present then no fastener rotation has occured. Our locking systems are used on the Space Shuttle, Caterpiller Tractors, Ford Racing, Armored Combat Vehicles and many, many other applications. CV JOINT 10MM Item Number: 8328 (12) 10mm-1.50X60mm 12PT Bolts. Stage 8 manufacturers the World's Best Active Mechanical Locking systems. Our locking fastener solutions are fail-safe when used and installed as directed. They are removable and reusable and can be visually inspected; if the locking retainer and clip are present then no fastener rotation has occured. Our locking systems are used on the Space Shuttle, Caterpiller Tractors, Ford Racing, Armored Combat Vehicles and many, many other applications. CV JOINT 3/8-24 X 2 1/4 Item Number: 8322 (12) 3/8-24x2 1/4" bolts 12pt. Stage 8 manufacturers the World's Best Active Mechanical Locking systems. Our locking fastener solutions are fail-safe when used and installed as directed. They are removable and reusable and can be visually inspected; if the locking retainer and clip are present then no fastener rotation has occured. Our locking systems are used on the Space Shuttle, Caterpiller Tractors, Ford Racing, Armored Combat Vehicles and many, many other applications. CV JOINT 3/8-24 X 2 1/2 Item Number: 8323 (12) 3/8-24x2 1/2" bolts 12pt. Stage 8 manufacturers the World's Best Active Mechanical Locking systems. Our locking fastener solutions are fail-safe when used and installed as directed. They are removable and reusable and can be visually inspected; if the locking retainer and clip are present then no fastener rotation has occured. Our locking systems are used on the Space Shuttle, Caterpiller Tractors, Ford Racing, Armored Combat Vehicles and many, many other applications. CV JOINT 8MM Item Number: 8325(16) 8mm-1.25X50mm 12PT Bolts. Stage 8 manufacturers the World's Best Active Mechanical Locking systems. Our locking fastener solutions are fail-safe when used and installed as directed. They are removable and reusable and can be visually inspected; if the locking retainer and clip are present then no fastener rotation has occured. Our locking systems are used on the Space Shuttle, Caterpiller Tractors, Ford Racing, Armored Combat Vehicles and many, many other applications.